Buy Cloud Nine Panicum Switch Grass here at Greenwood Nursery. Cloud Nine Panicum Switch Grass is perfect for areas that remain lightly damp as well as sandy or clay soil. One of our taller growing switch grasses topping out in the 5 to 7 feet height range. the gold plumes push past the foliage tips. Leave the plumes on the plant over winter to go to seed for birds and other wildlife. Cloud Nine Panicum will grow in part shade. Too much shade and the plant will lose it's shape. As with other ornamental grasses, weed-eat this switch grass back to the ground in late winter before new spring growth begins. 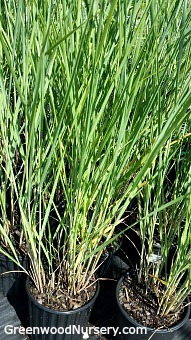 Cloud Nine Panicum is grown in one gallon containers. Plants shipping to CA and AZ addresses will be bare rooted before being prepped for shipping.